Click on the ''Connect Shopify store'' in the side menu of Oberlo. 2. Click on "Connect Store". 3. 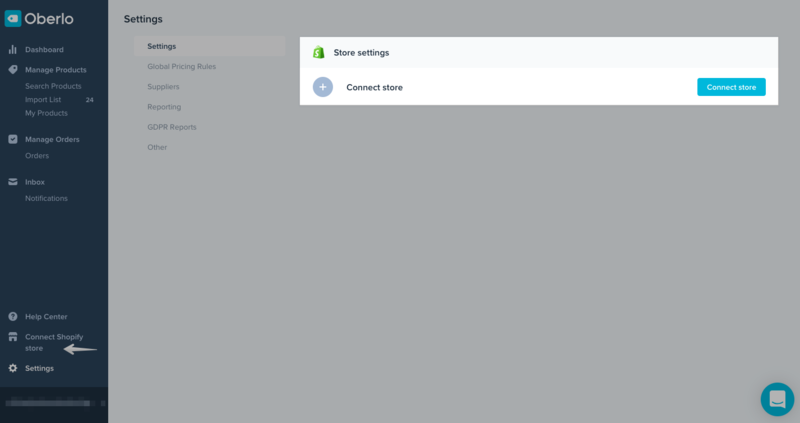 From the pop-up window, type in your existing Shopify store URL, or click "Create one new" and confirm the request. 4. Once your store is connected, you will be able to access general and auto update settings and adjust them according to your needs. If you try to connect your Oberlo account to a Shopify store, you may receive the notification “This shop is already assigned to Oberlo”, which indicates that there is already an Oberlo account assigned to your Shopify account. If this is the case, you will need to use the Oberlo account, which is already connected to your Shopify store. You can access this Oberlo account easily through Shopify Apps page — no login details are needed. Note: We are sorry, but it is not possible to connect multiple Shopify stores to a single Oberlo account or switch the Shopify store after they are already connected. Every new Shopify store will require to connect a new Oberlo account.